This customer in Barnardsville had bacteria in their spring water and a UV ( Ultraviolet ) light filter is the best way to remove it. After testing of the water confirmed the presence of bacteria, we installed the UV light filter. 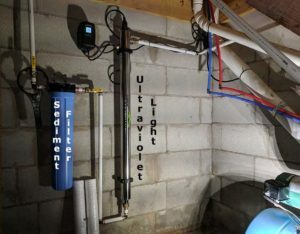 We also installed an in-line sediment filter to catch any particulates prior to the water going through the UV light. No more hauling gallons of water to be able to drink and cook!